Colchester United have agreed an undisclosed fee with Walsall for Saddlers defender Daniel Fox. The 21-year-old, who is out of contract this summer and recently refused the offer of a new deal, will now discuss personal terms with the U's. Fox is a former Everton trainee, who joined Walsall in June 2005 after failing to make a first-team appearance for the Goodison Park club. 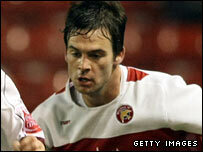 Since then, he has made 118 league and cup appearances for the Saddlers. He was a regular in their League Two title-winning side last season. However, if he were to remain at the Bescot Stadium until the summer and join another club when his contract expires, Walsall would still receive compensation as he will still be under 24.